I'm not sure anyone appreciates rhubarb the way the Scandinavians do. In the US, it seems like you rarely find rhubarb without strawberry to mellow it's tartness. But in Norway, rhubarb stands very much on its own. In fact, R remembers as a child being given stalks of raw rhubarb with a small bag of sugar for dipping and munching. This cake is not much more complicated than that. You melt the butter, so there's no waiting for it to soften, and then you pretty much just beat the rest of the ingredients in with your trusty hand-held mixer. In fact, you could probably have this one on the table ready for eating in less than 45 minutes, and that's including the 30 to 35 minute bake-time. 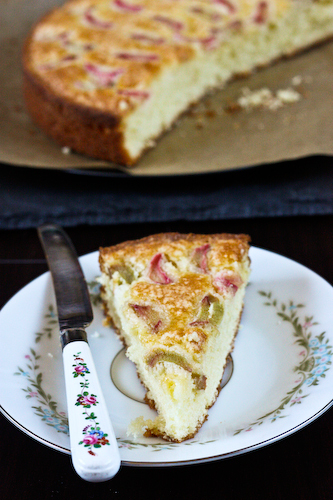 I love these simple snacking cakes, and my favorites always feature fruit. They're simple, true, but totally addicting as well. 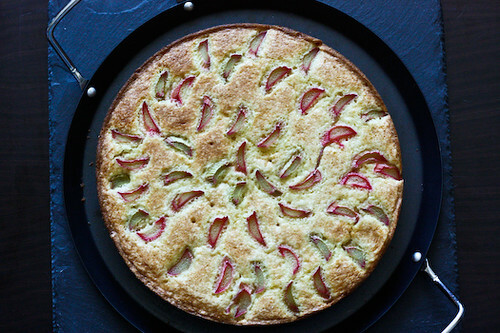 This one has only 1/2 a stick of butter, so it's not at all greasy, and the little slices of rhubarb on top kind of bursts in your mouth, full of the tartness of spring. Grease a 9 inch round cake pan or springform pan. Preheat the oven to 350F. Cut the rhubarb into small pieces and set aside, discarding both ends of the stalk. In a medium bowl, beat the eggs and sugar together until light, fluffy and a pale yellow. About 1 minute. Add the melted butter and the milk and beat until incorporated. Then add the flour and baking powder. Continue to beat until just combined. Pour the batter into the prepared cake pan. Arrange the rhubarb slices on top of the batter and place on the middle rack of the oven. Bake for 30-35 minutes. Remove from the oven and turn out onto a cooling wrack. Serve and enjoy. UPDATE: Don't cut your rhubarb too thin. You want good-sized chunks, maybe 1/2". You don't want them to disappear into the batter. What a lovely looking cake. Rhubarb is delicious, its something I associate with my childhood and doesn't seem to get much of a look in as an adult- need to sort that out! This is my first year using rhubarb, and I am thinking the stalks I got at my farmers' market aren't very flavorful. I'm intrigued, though, and hope to find some more. I tried one sweet and one savory dish and plan to post about them in the next week...yours looks and sounds so much better than mine, maybe if I get my hands on some more I will try it! Yes! Let the rhubarb be the star. I love rhubarb so much. 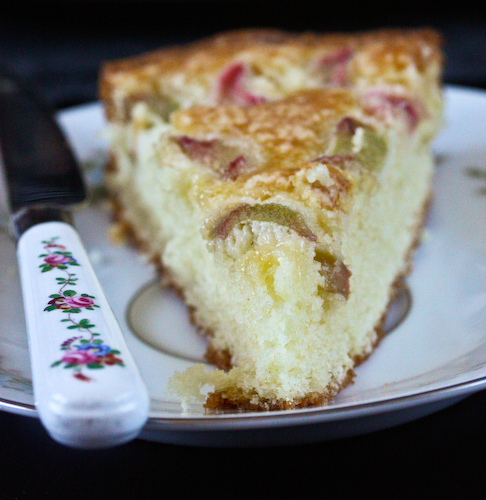 I definitely at a lot of rhubarb dipped in sugar and rhubarb cake as a kid. Have you made Norwegian rhubarb soup as well? Oh, you are wrong! I totally appreciate rhubarb! I always thought it was a Northern thing - both of my parents are from Chicago and I grew up eating rhubarb pie (without the strawberries) when I'd go up for a visit. But no one in Mississippi - where I live now - appreciates it. Everyone turns up their nose. I am interested in making this cake, but it will have to be when it's just the parents and me! Gorgeous cake!! Looks really delicious! Cityhippyfarmgirl, my husband also associates it with childhood. There's just something about rhubarb I guess. Sarah, humm, yea I'd try again with rhubarb, because they're supposed to be pretty full of flavor. Hope you have better luck next time! Fiveandspice, we made rhubarb soup last year, and it's so addicting, especially with a little sprinkle of mint. Heaven. Lisa, maybe you're a secret Scandinavian! Simple, yet elegant, this cake shines! What's not to love about a cake than can be on the table in 45 minutes? I've just come into a wealth of rhubarb--I think we need this for tea tomorrow. Thanks! Lovely cake. Can't believe how simple it seems. Must try. Made this yesterday for a get-together...it is simple to make! And it looks so pretty! What I learned: I cut the rhubarb VERY thin, and I am sorry I did. Next time I will leave them in bigger chunks so I can get a good hit of rhubarb when I bite it. This cake is delicious, soft and light and not too sweet. A big hit! That looks really good. Having a blog focused on Scandinavian food and culture, I've been really enjoying discovering new recipes for tasty Scandinavian cakes and other baked goods. I'd like to try making this one soon. Paula, I'll add a note about that to the recipe. Luckily it's easy enough to make again! Ha, I just DID make it again! It's so tasty! The cake looks fantastic, but you have the wrong "it's." With an apostrophe, "it's" is a contraction for "it is." You need the possessive form of "it," which does not take an apostrophe. Hope that helps. Hi there! 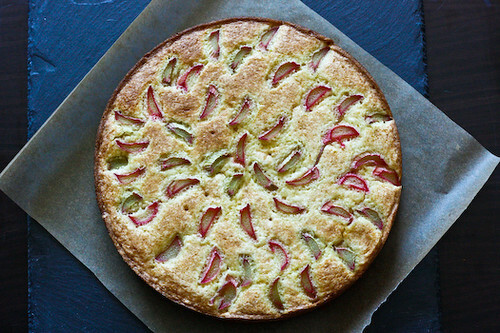 I live in Norway (but will confess to being American) and just posted a recipe for Norwegian rhubarb cake too. There are a few differences in our recipes, most notablly the amount of butter used (mine has two sticks!) Just wanted to say I love your photos-especially the overhead shots of the cake as a whole- so pretty! Wish I had gotten better shots of my cake.